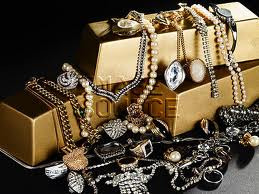 The appraised new value of your jewelry and the reality of what you get when selling old jewelry for scrap are very different. Many clients come in to sell jewelry and believe the value is what it appraised for when it was new. An insurance appraisal value is the amount you would receive for a lost piece of jewelry to replace with a new item. A new piece of jewelry has many factors involved to make up the price you are paying including: design work, casting, metal, diamonds, diamond setting, polishing, finishing, and profit. When you go to sell jewelry for whatever reason, the value is based on a set of totally different factors. Most jewelry is purchased for scrap, so the buyer is only paying you for the pure metal, and the diamonds that have value to be reused. Some diamonds were cut specifically for a ring design and are difficult to use in future creations. When selling, you lose the labor and profit that you were charged with your original purchase. Some rings, due to the quality of their craftsmanship or antique value, may not be scrapped and will be worth more of a premium because of their value to be re-sold as is. It is important to remember, the individual buying your old gold or diamonds, is not going to pay more than he pays within the industry. You are selling the pure metal and diamonds. You will still be receiving a fair price based on scrap value. After the alloys are added, these are the percent gold, The Karat System, used for jewelry. When you sell metal that has alloy mixed, to lower the percentage of pure metal, you do not get paid for the alloy. In other words if a piece of jewelry is 10 karat gold, you will be paid for the 41.6% of pure gold; the 59.4% of alloy is melted away. The same goes for the other karat percentages. The only dollars paid for scrap are for the pure gold. COME TO RICHARD DOLGIN PRIVATE JEWELER TO ALLOW US TO ASSAY YOUR METALS, DIAMONDS, AND JEWELRY. I WILL DO A THOROUGH AND PROFESSIONAL JOB TO MAKE SURE YOU GET THE OPTIMUM DOLLARS FOR YOUR VALUABLES.